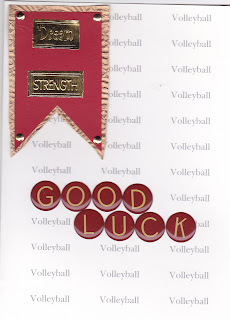 This week at Just A Scrappin' the challenge is to make a card, layout or project about volleyball. Use the colors maroon, gold and white and add brads. Here I used Cricut cartridge Art Philosophy Banner 2 size 3 inches in maroon and 3 1/4 in gold with gold brads. I had letters with maroon and gold that worked with this challenge. Sherry good job on this one! I love the words of encouragement for the game of VB!! not a spots fan, but want to encourage others that are. Nice card. The Good Luck really pops off the card nice!